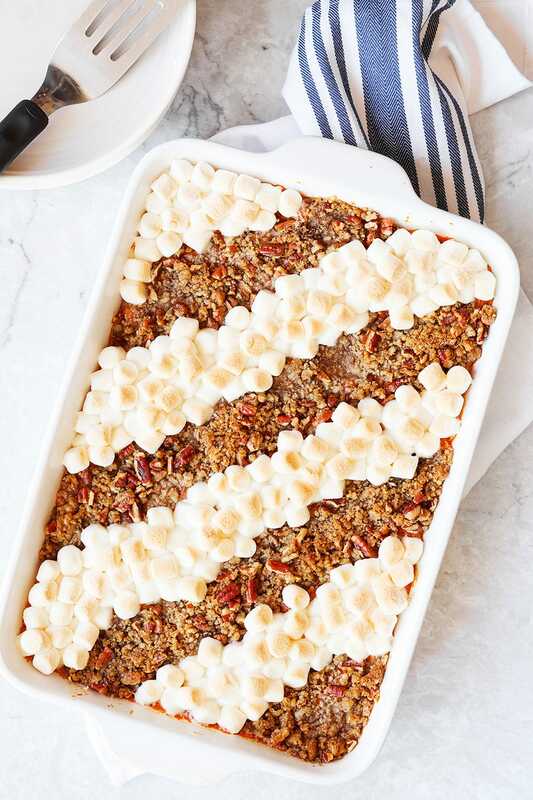 This crowd-pleasing sweet potato casserole has both a pecan topping and a marshmallow topping for the best of both worlds! 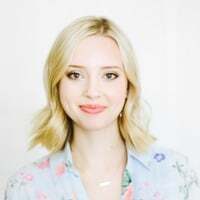 Taste: I love the slight hint of maple and nutmeg in the filling and of course either topping just makes you feel like you’re eating dessert for dinner in the best possible way. 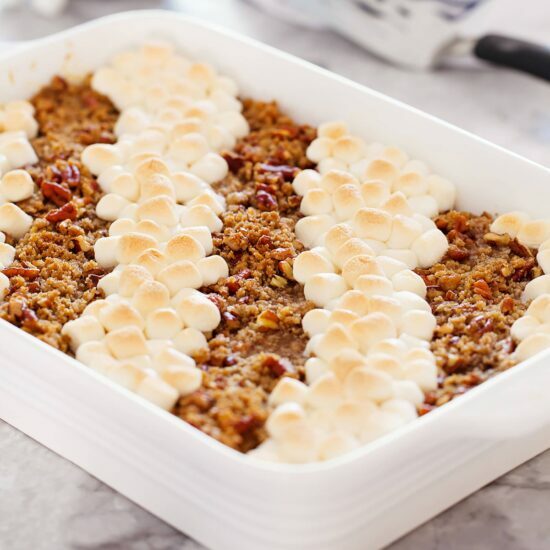 Texture: The filling is rich, soft, and creamy without being too whipped and of course the texture of the topping depends on which spoonful you go for – crunchy pecan topping or gooey marshmallow. Ease: Very easy, even when using fresh sweet potatoes. Appearance: So fun!! This really shines on any Thanksgiving table. Pros: You get the best of both worlds and the filling recipe is quite scrumptious. Would I make this again? Absolutely, every holiday season! My favorite Thanksgiving side dish has been sweet potato casserole ever since I can remember. That’s probably because the casserole is basically dessert disguised as dinner. That’s something I can ALWAYS get on board with. I’m particularly fond of that buttery brown sugar pecan topping. However, I know many people and families prefer the marshmallow topping. That’s why this is such a crowd pleasing recipe. You can offer your Thanksgiving guests BOTH so everyone is happy! You can even put the best of both worlds on your own plate if you can’t decide. 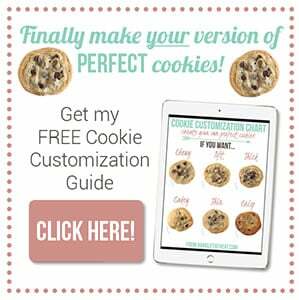 This recipe is actually an adaption of one of the first holiday recipes I ever posted on the blog way back in 2009. Many years later and I think I’ve only further perfected this recipe! Using fresh sweet potatoes makes a big difference. The casserole I grew up eating relied on canned yam puree which does cut the oven time down, but it also cuts the flavor. Bake your potatoes ahead of time and refrigerate the flesh until you’re reading to make the casserole. I also don’t use any processed sugar inside my filling, instead I rely on maple syrup to add sweetness and a nice depth of flavor. Since the topping is so sugary, you really don’t miss the sugar and it makes this casserole slightly more acceptable to eat as a part of dinner. What’s you favorite part of Thanksgiving? The side dishes? Dessert? Turkey? Preheat the oven to 400°F. Pierce the potatoes all over with a fork and place on a foil or parchment lined rimmed baking sheet. Bake until they are tender on the inside, about 45 minutes. Reduce oven temperature to 350°F. Let the potatoes cool slightly then slice open and scoop the flesh into a large bowl, discarding the skins. Mash with a potato masher, being careful not to over-mash. Add the milk, maple syrup, eggs, vanilla, salt, and nutmeg and stir until just combined. 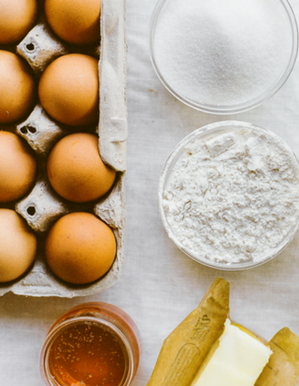 In a small bowl combine the flour and butter, cutting the butter into the flour with the back of a fork. Add the brown sugar and pecans and stir until combined. Spread the potato mixture into a 13 by 9-inch or similarly sized baking dish. 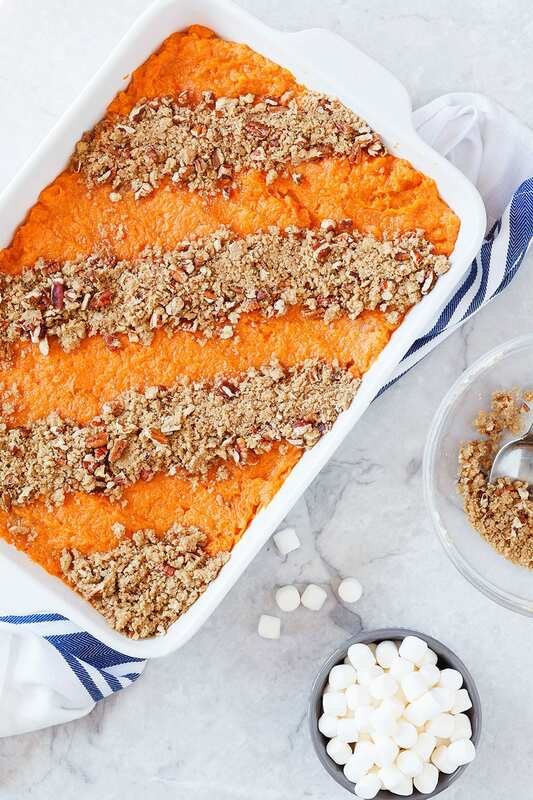 Sprinkle the pecan mixture in diagonal rows over the sweet potatoes, leaving a 1 1/2-inch gap between rows. Bake at 350°F oven until golden brown on top, about 30 minutes. Remove from oven and gently place the marshmallows between the rows of the pecan mixture. Bake for an additional 10 minutes, or until the marshmallows are just golden brown. Serve. Love that you used maple syrup as the sweetener! I bet it adds another great layer of flavor! Everything about this sounds so good, I love the pecans on top. 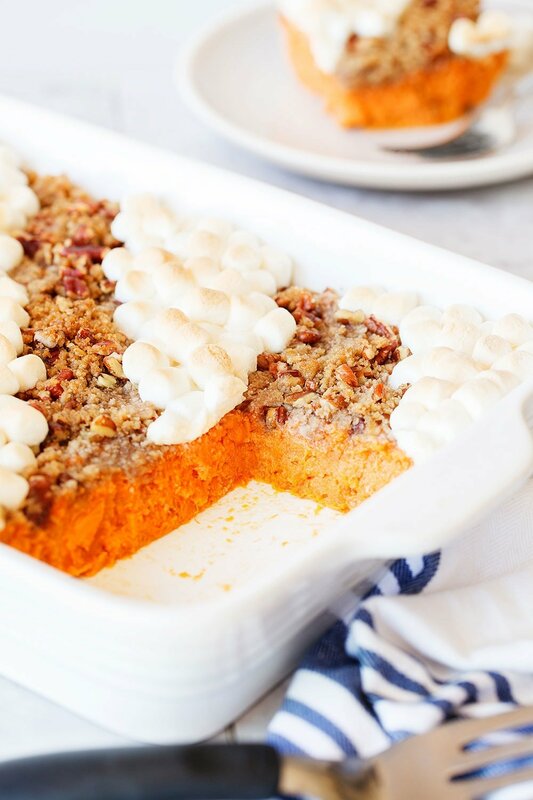 A great topping is the key to Sweet Potato Casserole! This makes me so excited for Thanksgiving! So clever to make everyone happy with one casserole! Plus it looks so wonderful! I split the recipe in half and made it for my boyfriend and I to accompany a maple glazed pork tenderloin I made this past weekend. This was AMAZING! I have a feeling this is going to be an oft-made side dish from now on. The maple syrup really makes this dish and adds a great subtle flavor to the sweet potatoes. 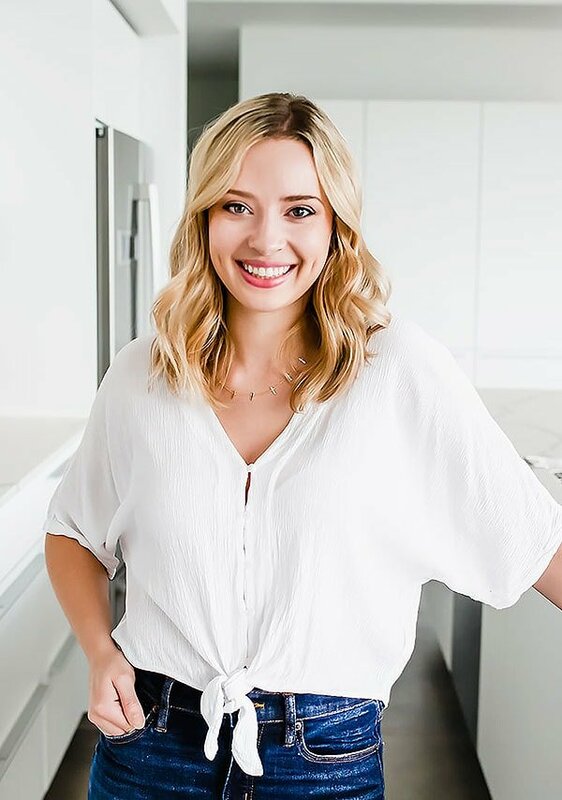 I made this recipe for Christmas dinner and it was a HUGE hit! 2 of the people didn’t like sweet potato and another didn’t like sweets and they all loved it and got seconds. Everybody alao raved about how pretty the dish was. I will be saving this recipe to make again. Only changes I made to the recipe was add a teaspoon of cinnamon to the sweet potato mash and omit the flour in the pecan mixture. Can this dish be made ahead and refrigerated, then cooked for the meal? Seems like it, Maybe not put the pecan mixture on until ready to put in oven? Trying to plan my Thanksgiving meal prep. Thanks. Made it for Turkey day. GREAT Making it for wife’s Christmas party. very nice dish, especially since I love sweet potatoes and always appreciate a new recipe, thank you! I added orange zest and it was delicious! Everyone loved it! !